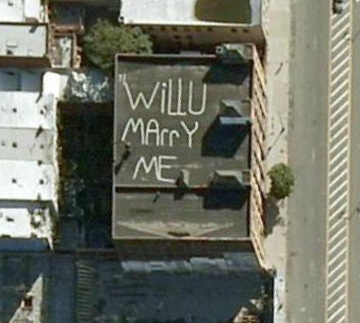 Thanks to the growing popularity of Google Maps, a number of romantic messages etched and painted on the surface of the Earth have been captured from way up high and viewed by millions of people over the past 5 years or so. You've got to hand it to those responsible for these efforts: successful or not, it's a grand gesture and a tough one to plan. Some were written purely to be seen on websites such as Google Maps itself, others probably from aircraft as part of a less geeky plan. 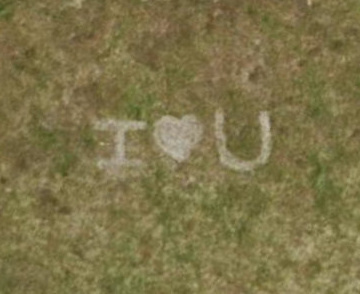 [Above] We'll start with the simplest message possible, as seen in a field in Thousand Oaks, California. We're unsure as to the artist's identity and maybe this is a general declaration to the entire population; we're not sure. Click here to feel the love on Google Maps. [Above] Whoever was trying to woo Gina went to quite a lot of effort with this enormous, multi-coloured shout-out. It can (or could - we're not sure) be found on a couple of ghost ramps on State Route 520 in Seattle and was hopefully greeted with a positive reaction. Click here to feel the love on Google Maps. [Above] The City of Duisburg in Germany is home to the possibly desperate declaration of love seen in the picture above. We wonder whether the artist was responsible for the love interest's departure. If so, pleading forgiveness doesn't get much grander and more unique than this. Click here to feel the love on Google Maps. [Above] We'll stay in Germany for this next example, as seen on a beach in Roston. 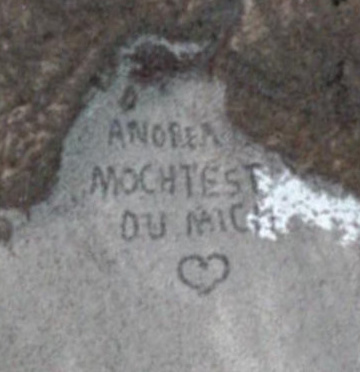 Now, according to the Google Sightseeing site, the translated version of this charming message would read 'Andrea, Do You Like Me ♥' but as we don't speak German we can't be sure. Click here to feel the love on Google Maps. [Above] Onto marriage proposals. A rooftop in New York is home to the mixed-case question you see above, a sentence which seems to be aimed at no-one in particular just in case you wanted to use it yourself and claim the credit in future. Click here to feel the love on Google Maps. 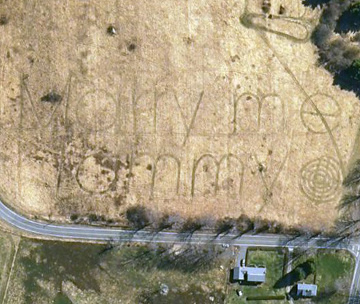 [Above] 'Marry me Tammy' is the supposed message seen in a field in Richmond, MA, although it looks more like 'Marry me Mommy' to the untrained eye. 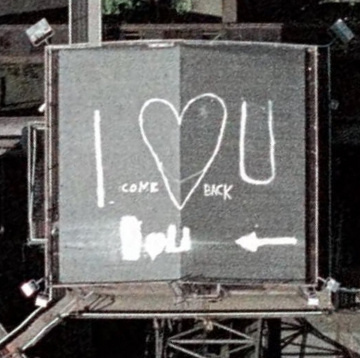 The letters are 100ft tall and were used, successfully, by a guy named Brian to propose to his girlfriend from a plane in 2004. Read more here. Click here to feel the love on Google Maps. 7. PROPOSAL 2.0 - MARRY ME LESLIE!! 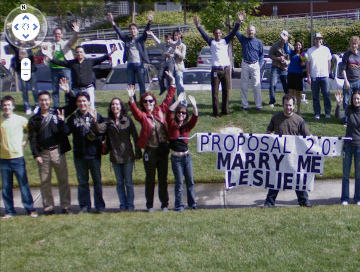 [Above] A Google employee named Michael used his contacts within the Street View team to coordinate the incredibly geeky proposal above, photos of which were taken by the Street View van as it drove around Google's Mountain View offices. Read more here. 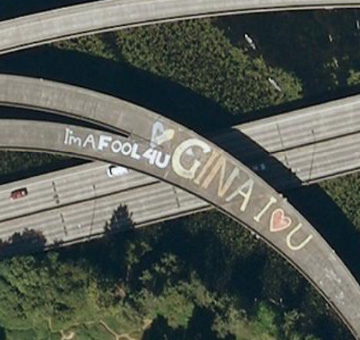 Click here to feel the love on Google Maps.